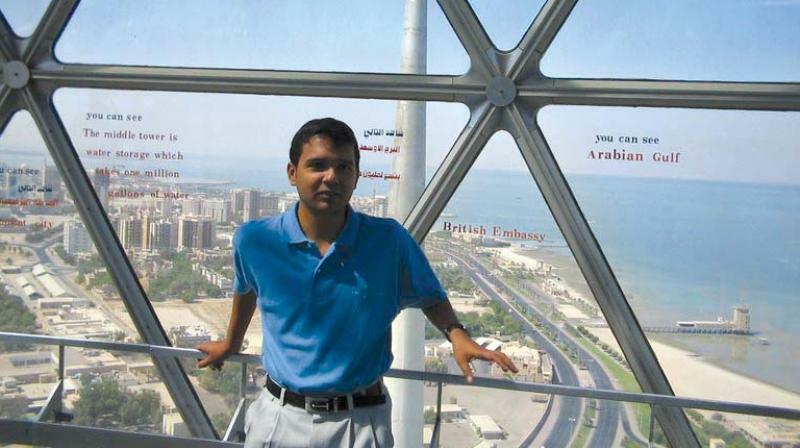 Sunil Mishra during his travels. Sunil Mishra’s book Transit Lounge changes the monotony of travel! From only foreigner’s writing their travelogues, Mishra decided to write a book based on his travel experiences to over 30 countries in the past 15 years. For this Jharkhand-born corporate professional, writing the book was purely co-incidental. His travels took him to Tehran, Egypt, China, Turkey, etc. “I started travelling in 2003, and in 2009 when I had travelled and learnt enough, I started blogging. The reviews prompted me to compile my experiences into a book,” explains Sunil who considers authors George Orwell, Hermann Hess and Sanjeev Sanyal as his biggest inspirations. He started writing the book in 2007 and was done by 2009. In 2016, he finally got it published. He still works for the corporate sector but plans to write more books, and about his travelogue, he explains, “There are a lot of book on travel, but all are factual. None of them are first-hand experiences. The whole idea was to write an Indian perspective. This book captures experiences at airports, conversations with locals, culture, food, historical places and also Indian immigrants, there. The writing is not academic but more first-hand experiential writing.” An alumni of IIM, Lucknow, he adds, “I think I learnt more about India while travelling abroad. I also learnt that each place I went has some traces of Indian culture like the Kohinoor Diamond in London.” Recalling some of the funny anecdotes, Sunil recalls, “I remember this one time in Georgia, the hotel I was staying at had organised a party for their staff. None of them spoke English, and we couldn’t understand their language. After a few rounds of drinks, we were surprised to see the staff singing Bollywood songs, Raj Kapoor’s songs!” Another episode was a bit alarming but funny, “Ladies in Tehran are expected to wear a burkha at all times. But at the office where I worked, the ladies removed the burkhas and were wearing casual clothes. In the process of taking selfies, I had clicked a few pictures of them by mistake. This alarmed them, and they started crying and I deleted all the pictures,” he says. About travel writing in India, Sunil feels, “A lot writers touch on genres like pure romance but there are few books about travel. I think with time, these genres too might improve.” Sunil took over three years to write Transit Lounge, “Most of my writing is based on recollection, a few notes and a little research. Corporate life allowed me to write only on weekends,” Sunil adds. He also has a few books lined up, one a corporate fiction about a company’s transformation into a corporate set-up tentatively titled Dance of Digital. “I have one more book, it is about Indian perspectives and what it means to be an Indian,” he signs off.